Saturday we went to the Monroe County Sheep & Craft Festival in Waterloo IL. Google maps failed us and sent us out of town on the wrong side of town, but a nice person at the gas station put us on the right route. We met friends and had the lamb lunch, which was amazing. Grilled sausages, lamb burgers, lamb chops, salads, coleslaw, tons of tasty food. Every half hour, a sheep was taken out of the barn to be sheared. I watched a large black-faced white-fleeced sheep get clipped, and the sheep was not happy. It kept yelling its disapproval of the process while leaning on its behind against the shearer. The fleece was quite thick, several inches long and very dense. Once it was clipped off, it was dumped in a big bag, and the naked sheep was led back into the barn. Shearing took only a few minutes, and as a spinner, I saw where second cuts come from, the places where the clippers didn’t get close enough the first time, or the sheep wriggled. The Flemish Giant rabbit weighed in at about 20 pounds, and it’s only a year old. It’s a meat breed so the coat wasn’t as soft as the Rex rabbits, and it seemed like a placid animal. It just lay in its cage, watching the world pass by, getting bigger and bigger. I did bring some fibre home with me. An ounce of grey French Angora, some Border Leicester/Mohair blend, and some alpaca batts from Connie at Breezy Ridge Alpacas. One set is suri alpaca, Cormo wool, and tencel, the other is suri alpaca, merino, and bamboo. I went with Connie and two of her alpacas to MOPACA in 2009, and her fibre is very clean. I always have a hard time passing up the rabbits. My brother and I raised rabbits when we were kids, and I love the little fluffers! 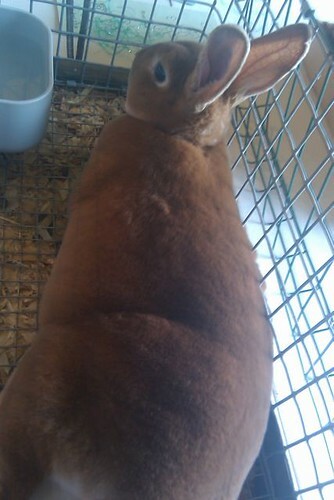 We raised rabbits when I was in Jr. High and High school and showed them on the national circuit. I had French and Giant angoras and my brother had Rex and Mini Rex. (This was just when the Giants and the minis were being developed, so we were some of the first in the state to have them.) We absolutely loved it, and I can’t wait to get back to it!